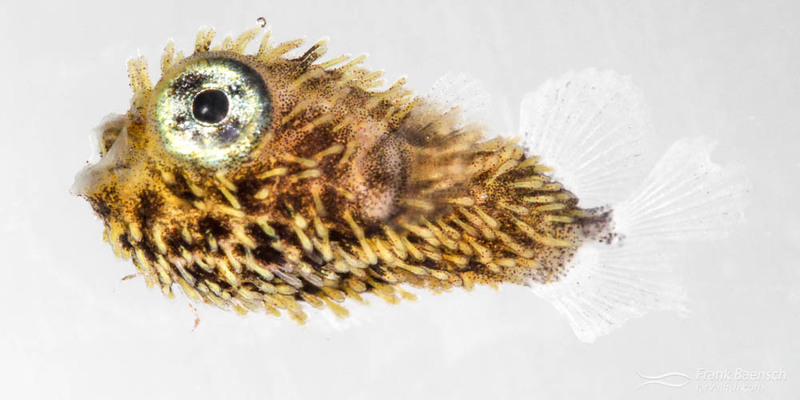 Spiny porcupinefish (Diodon holocanthus) larvae were raised from wild-spawned eggs at 77-79F on wild copepods and artemia. First record of Spiny porcupinefish culture. Porcupinefishes, blowfishes or balloonfishes (Diodontidae) are slow moving, rotund, spinose, medium-sized fishes comprising 6 genera and 19 species. Other characteristics include an inflatable body, the absence of pelvic fins and jaws which contain two fused, parrotlike teeth. One porcupinefish species is epipelagic. All other species associate with reefs or sandy ocean bottoms. They primarily feed on invertebrates (often mollusks, sponges, hermit crabs, sea urchins and coral) using their well-developed beak. Porcupinefishes have no economic value, aside from being used in Chinese medicine, and are not cultured on a large scale. They have, however, been raised for research purposes. Adult Spiny Porcupinefish (Diodon holocanthus) on a reef in Indonesia. Spiny Porcupinefish eggs (Diodon holocanthus), while not abundant, were fairly common in neuston tow samples during the warmer months of this project. D. holocanthus eggs are large (about 1.7 mm in diameter) and have multiple oil globules and an embryo covered with yellow spots and faint red pigmentation. The incubation period is 3 to 5 days, which explains their common occurrence in the tows. The larvae were reared many times and are easy to identify by their deep and wide, dorsal ventrally flattened body, heavy dark to orange pigmentation and short tail. Spiny Porcupinefish (Diodon holocanthus) larvae reared in the laboratory. D. holocanthus accept larger live foods (large nauplii, copepodites) at first feeding and are relatively easy to rear, except for a noticable susceptibility to bacterial infections in the later stages. The larval period is about 25 days. The unique morphology and behavior of porcupinefish larvae and juveniles makes raising them worthwhile.